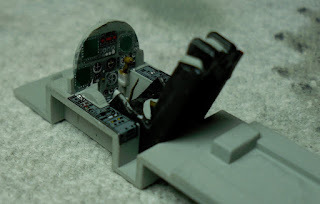 Knowing that I have another - rather larger - 1:12 car coming as a present tomorrow, I have started out on a small 1:72 aircraft as this is all I seem to be able to do when it comes to flying things. 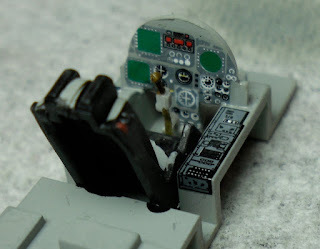 This cockpit is only 4cm long! 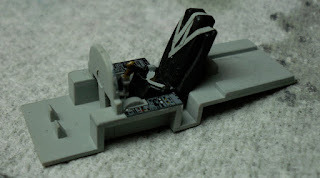 The seat belts are made of painted Tamiya masking tape to simulate a 5 point harness. I am experimenting with a new masking material. It is called Parafilm M and is a medical material. It has no adhesive but when you stretch it, it gathers static and seats itself perfectly to the canopy, whch has been dunked in Pledge Multi Surface Wax, We shall see how this comes out. Christmas Day tomorrow so aI would like to wish all of my 'readers' a happy Christmas and a prosperous New Year.